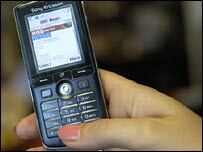 More patients are being allowed to use their mobile phones inside a hospital where the rules are being relaxed. Use of bedside phones at Ipswich Hospital has declined and patients blame high costs of calls. Jan Rowsell, head of communication, at the hospital said patients were now being offered a choice. They can use their own mobile phones in all the public areas of the hospital while a new overall policy is developed. "We do appreciate that mobile phones are a fact of life and most of us have them. They are an important link with family and friends for people in hospital. "We want to enable them to use their mobiles easily in the hospital within the bounds we've got on the sensitivity of medical equipment. "We are now developing a new mobile phone use policy on the basis of technology moving on and we're working with patients and their representatives to bring this to the trust board for clarity. "The situation at present is that mobile phones can be used in all public places at the hospital."